Such wikis have proven their sustainability and relevance, the two biggest ones this model being Vikidia in French and WikiKids.nl in Dutch, with respectively 16000 and 14000 articles. This post of a retired teacher that was involved in the Freinet movement insist on the need for a living documentary resource that fit well to children. More than 80 years ago, while school failure already was an issue, teachers became aware of the shortcomings of lectures requiring all pupils in a class to work on the same assignment at the same time, without taking into account either of their individual pace, or their personal interests that could stimulate their excitement to work. On the other hand, the disciplines partitioning, each one being handled in separate textbooks, did not allowed to link together every different knowledge and then arouse an unpredictable boost to other aspects of the subject, not only the how, the why the how much, but also the sight on what it once was and what it is now elsewhere, as well as traces in our language, sometimes artistic, and even openings to some literary or artistic works. These teachers who wanted to modernize school imagined to create cooperatively documentary sheets that each child could study at its discretion. Some brought information, usually illustrated, other brought incentives to observation or (safe) experimentations. Other sheet would suggest diverse extensions of one subject. Among these various documentary sheets, spread on a table, the children chose, exchanged documents, and when sharing what they had learned by a short lecture to the class, they memorized with enthusiasm much more knowledge than with a good old style lesson. This documentation was fuelled by the contributions of many classes, through surveys and multiple searches. For example, a child telling the comings and goings of swallows in their nest, built under the roof of his home, would give rise to the desire of others, according to their taste and not a a mandatory task, to find out what this nest is there for and how brood can hatch chicks compare nests of various birds, their different ways of eating, to question the migration of swallows and other birds, ask Alsatian friends about storks ( »Alsace is a region of France known among other things for its numerous storks »), study if the birds are the only animals to breed by laying eggs, etc… This would possibly add a new documentary sheet out of these research to existing ones. Another example: on the elephant had been created multiple files or sheets from different sources, featuring its description, its size, its weight, but also its feeding, the use of his trunk, his tusks (including including the use of ivory), its group life in the bush, its domestication as a beast of burden in Asia and even its use in war by Hannibal (with extract of the literature on this episode). We knew less than today about his cousin the mammoth and we still ignored the ravages of poaching jeopardizing its African species. The use of this material was simple, provided teachers ensured strict classification and storage after use. The main problem for a large collection was in terms of editing and updating the content. This led to abandon the documentary sheets to concentrate on a brochures (called « working library »), whose management was easier then, but was confronted much later to the general difficulties of the publishing sector. Computers make it possible presently to classify and retrieve many documents, but does not magically solve all issues. Standing before the flood of images and information, sometimes bad, young people need benchmarks and answers to their questions that the curriculum does not always provide in a non daunting way. Hence the importance of a free online encyclopedia that can be freely accessed, going from one article to another without having to handle multiple printed volumes. 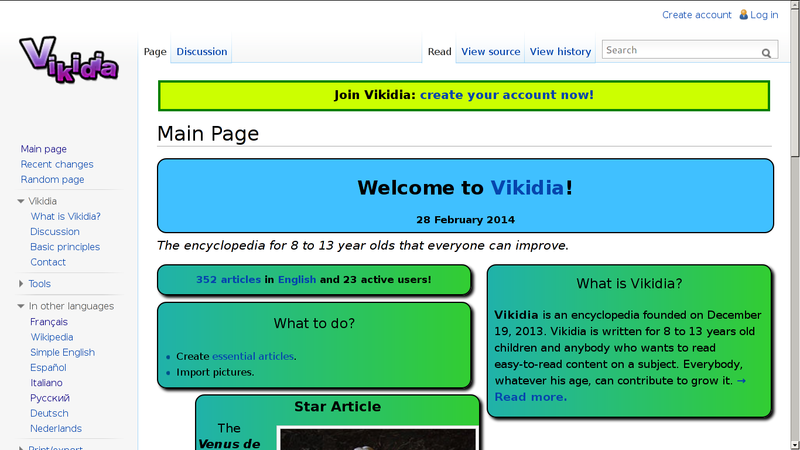 This is what Vikidia successfully brings, the encyclopedia for 8-13 old children. This age range corresponds to the beginning of mastering reasoning and reading and stops at the threshold of adolescence who have other needs and other documentary resources. However, the refusal of infantilizing young reader allows Vikidia be used by anyone, regardless of age, eager to find simple explanations of a topic that he doesn’t known yet. The intent is not just to respond with a simple definition, but offer different tracks, closely related to the subject without getting partitioned in a school discipline, because ties are obvious, for example, between the bee (insect), honey (food), beekeeping (breeding), pollination (botany), the danger of some pesticides (ecology). And these openings are easy to find by clicking on an internal link or one of the categories of the subject. In the wiki spirit, everyone can make contributions, including young people who can ask questions and propose, if possible in a group, the results of their research and investigations on the topic of their interest. Everything is reviewed by competent adults familiar with the needs and capacities of 8-13 years to make an encyclopedia that really fit them. This is what Vikidia achieves for over 3 years and it deserves to be widely known and recognized by all those who are interested in education. May this resource join the OLPC core activities be is online or offline for the benefits of the laptop users !